The National Farmers’ Day is on the 23rd of this month but how does that matter to you? You are not a farmer. Then why should you celebrate or observe this day at all? Isn’t this exactly your thought at the moment? Well, continue reading and you’ll be surprised. To Create Awareness: As per India Today, “More than 3000 suicides have been reported collectively from Maharashtra, Telangana, Karnataka, Andhra Pradesh and Kerala in 2015.” When you decide to dwell further into this day, you will automatically come across such startling facts and realize the gravity of a farmer’s plight. With the use of social media, when you share these thought-provoking realities, it does create an impact and initiates action, no matter how small. To Broaden Our Perspective: Even a day spent with a farmer can teach us many life lessons. As Luther Strange had pointed out, “Our farmers feed the world. They are up before dawn and work till well after sunset. They face any number of challenges they can’t control, from too much rain to not enough, from disease to insect infestations.” Patience, hard work, faith, endurance, physical strength, and consistency – these are all the much-required virtues that you can imbibe from a farmer. To Inculcate Gratitude: When you see how the food is cultivated and harvested with your own eyes, you begin to cherish the value of food in your lives. Also, you get to see how by producing food, relentlessly, farmers nurture your body and facilitate your dreams of focusing on your career and life in the city. To Support the Environment: When you support the cause of the farmer you naturally support the preservation of the environment. The methods used by small-scale or organic farmers help reduce global warming and prevent soil pollution. When you support farmers, they are less likely to sell out or lose their green lands to urbanization. 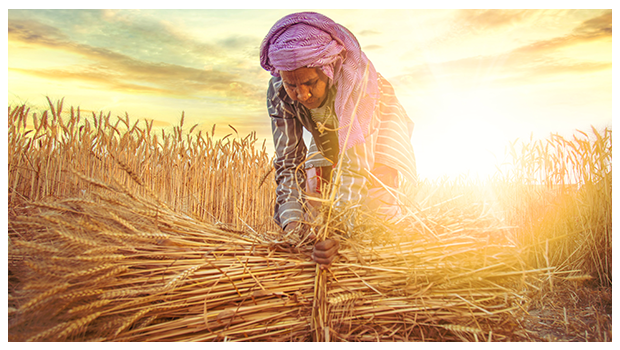 To Build a Strong Nation: Most farmers are poverty stricken and under the burden of perpetual debt. If farmers are taken care of physically, financially and mentally, nothing can stop India from being a truly developed country because farmers constitute about more than 50%-60% of the Indian population. Make this year’s celebration meaningful by switching to organic food. These chemical-free, natural edibles will not only do your body good but can also bring a smile on a farmer’s face. Think organic, choose 24 Mantra Organic.